Glenn Close is certainly one of the best American actresses of the last 40 years. In her distinguished career, she has received six Oscar nominations, but has never won. Will her new movie, The Wife, be the movie for which she will win the Oscar? This seems to be the main interest in her new movie. 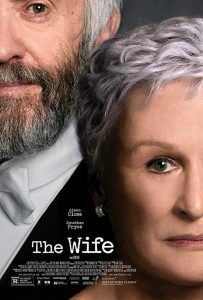 The Wife, based on a novel by Jane Anderson, tells the story of Joe and Joan Castleman (Jonathan Pryce and Glenn Close). Joe is a celebrated American fiction writer, and Joan is his wife. As the movie begins, Joe and Joan are awakened in the middle of the night by a phone call from Sweden. The caller informs Joe that he has just won the Nobel Prize for Literature. Of course, Joe and Joan are thrilled with the news. Parties are given in their honor as they prepare to travel to Stockholm to receive the honor. As Joe, Joan, and their son David are onboard their flight to Europe, a writer named Nathaniel Boone (Christian Slater) asks to speak to Joe. Boone informs Joe that he is writing a biography of him. Joe brushes him off, while Joan is taken aback by Joe’s curt response to Boone. At first, things go well for the Joe and Joan in Stockholm. However, David is unhappy to be at this celebration. We find that Joe has criticized his son’s first attempt at writing his own novel. Joe also is dismissive of Joan at a reception. Boone asks to speak to Joan, and asks her potentially damaging questions about her life and marriage. From this point on, everything goes downhill. Close gives another fine performance as Joan. At first, she is thrilled for her husband’s success. However, as secrets about their marriage come to light, she is barely able to control her rage until the inevitable explosion occurs. Flashbacks to early years of Joe and Joan’s relationship are interspersed throughout the film, starting with their first meeting as a student and her young married teacher. I liked these scenes, particularly because Close’s real life daughter, Annie Starke, plays young Joan in these scenes. Considering the talent involved and an interesting premise, The Wife should have been better than it is. It lacks the necessary intensity and suspense to make this a really good movie. The plot is relevant for today’s audience, but it plays more like a soap opera, with a melodramatic ending. While I think that Glenn Close is long overdue for an Oscar, I don’t think The Wife is a strong enough movie to win her the award this year.